Cheese is a staple on my grocery list and is used regularly in my recipes and snacks. Often, I’ll feel too lazy to cook something so I grab a big hunk of cheddar or mozzarella to satisfy my hunger pangs. If I’m feeling more adventurous, I’ll make cheese and crackers or cheese toast. There is no right or wrong way to eat cheese. It’s all good. Armstrong Cheese is a Canadian cheese brand started in the village of Armstrong, British Columbia in 1902. Now you can see where they got their name! I started buying their cheese when I moved back to Ontario in 2014. You can find their cheese in major grocery stores on the west coast and in Ontario. My favourite one is the Marble Cheddar cheese block. That’s the one you’ll find me sneaking slices here and there throughout the day! 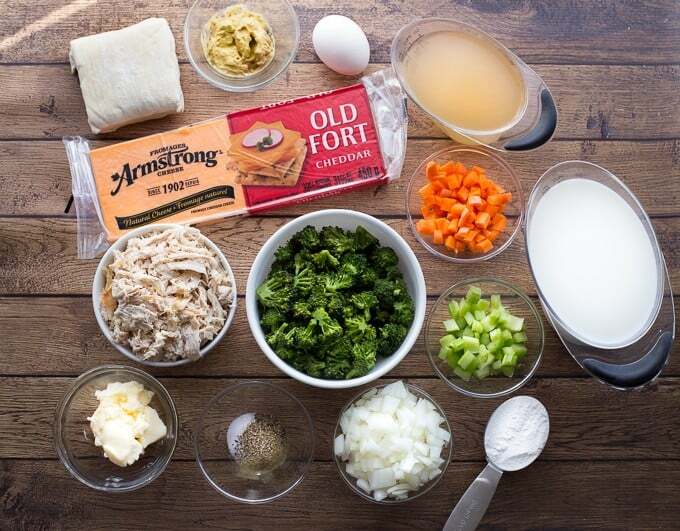 Armstrong Cheese recently created three new recipes and asked if I’d be interesting in trying one out and share with you. I knew instantly it would be a winner. 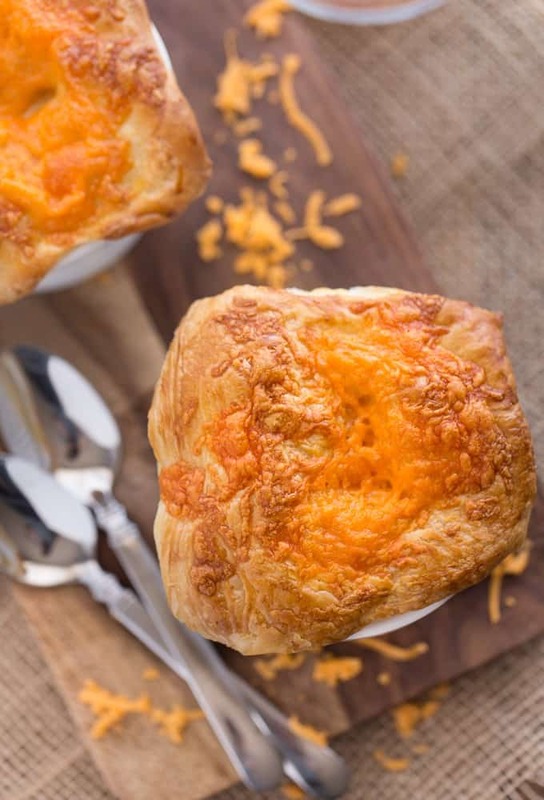 Meet the Chicken, Broccoli & Cheddar Pot Pies made with Old Cheddar Armstrong Cheese. It was well worth the little bit of extra effort! To save on time, I did a little bit of the prep work ahead of time. I cooked the chicken and broccoli the night before so it would be faster for me to prepare for dinner. Tip: leftover chicken works great or pick up a cooked rotisserie chicken at the grocery to save even more time. 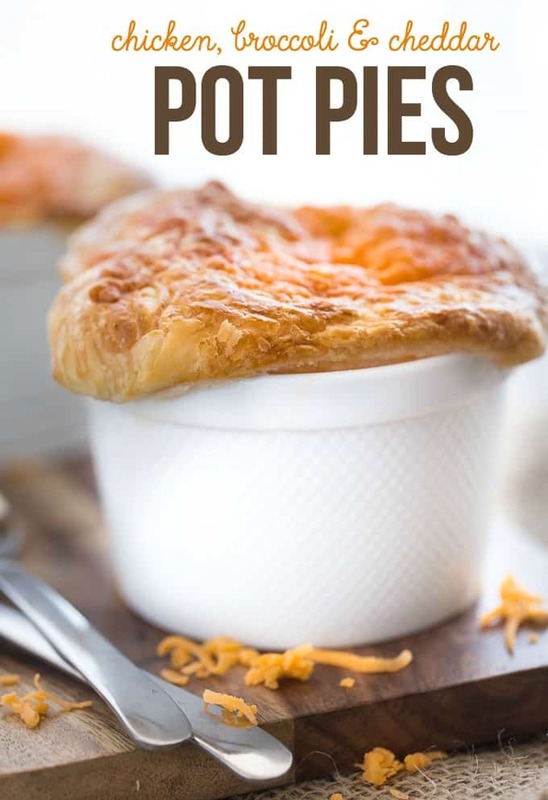 This chicken pot pie recipe is super cheesy, creamy, flavourful and made in an ovenproof ramekin! It turned out beautifully. My favourite part was the creamy filling with its savoury veggies, tender chicken and melted Old Cheddar cheese. It’s thick, rich comfort food. You have to try it! I want to hear all about it. It’s been a long time since I’ve made chicken pot pie and this recipe sure beats any of the frozen ones I’ve tried in the past. My family raved about how good it was and asked me to add the ingredients to my next grocery list so I can make it again. I still have some of the cheese left in the fridge, but knowing me, I’ll be nibbling on it over the next week. I’ll probably need to buy another block by then! 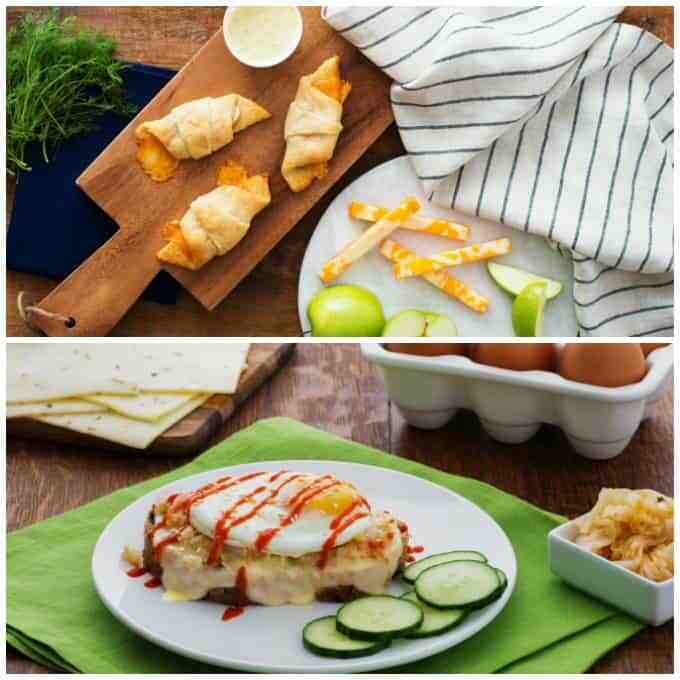 Check out these other yummy new recipes from Armstrong Cheese: Apple and Cheese Crescent Rolls and a Korean-Style Breakfast Sandwich. Each one has a video too. April is also Grilled Cheese month and I have a round up of grilled cheese sandwich recipes for more recipe inspiration. What is your favourite way to use Armstrong Cheese in recipes? 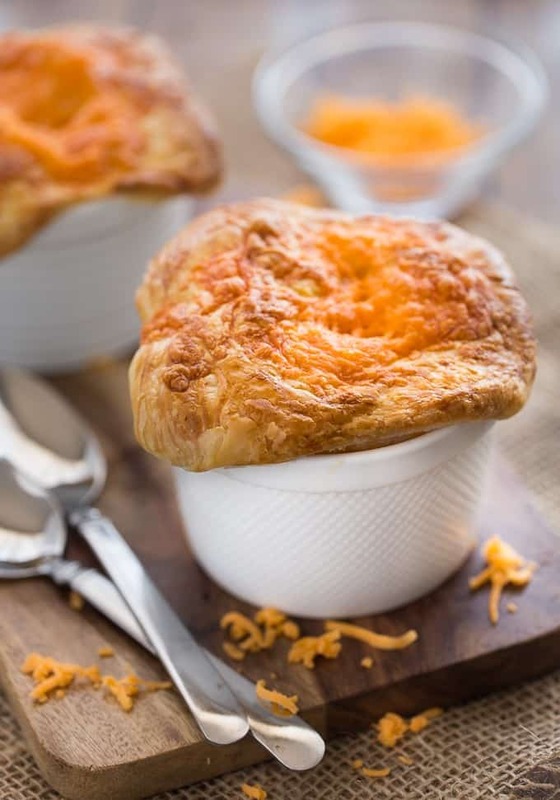 Super cheesy and flavourful with a thick, creamy filling of savoury veggies, tender chicken and melted cheese baked in an ovenproof ramekin! In a large skillet, melt butter over medium heat. Add onion, carrot, celery, thyme, salt and pepper, cooking for 5 to 6 minutes or until vegetables are tender. Sprinkle flour over the vegetables and cook, stirring, for 1 minute. Gradually whisk in milk and chicken broth. Stirring constantly, cook for 8 to 10 minutes or until mixture begins to simmer and thickens. Stir in broccoli, chicken, mustard and nutmeg; return to simmer. Remove from heat and stir in 1 1/2 cups of the cheese. Divide filling among six 1-cup ramekins; let cool slightly. Place pastry on lightly-floured surface and cut into six equal squares. Place one piece of pastry atop each ramekin, pressing gently to adhere. Beat egg with 1 tbsp water and brush lightly over the pastry. Cut two steam vents in the centre of each pie. Sprinkle the remaining cheese on top of the puff pastry. Tip: This dish is also delicious when made with dried or fresh rosemary instead of thyme. Recipe courtesy of Armstrong Cheese. I want to try Aged Cheddar, Chive and Buttermilk Biscuits. Aged cheddar, chive and buttermilk biscuits. I have always wanted to try Armstrong Cheese Stuffed Bread. Looks so delicious, actually all those recipes look fabulous!! ooooo! Cheese stuffed bread. Sounds delightful! I would love to try the 7-Layer Summer Vegetable Dip it looks so good!!!! I would love to try Aged Cheddar, Chive and Buttermilk Biscuits. Cheese rocks, you can add it to any meal and it makes it great! 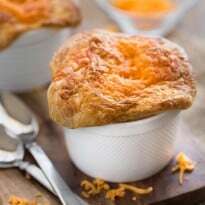 The Chicken, Broccoli and Cheddar Pot Pies look DELICIOUS!!!! 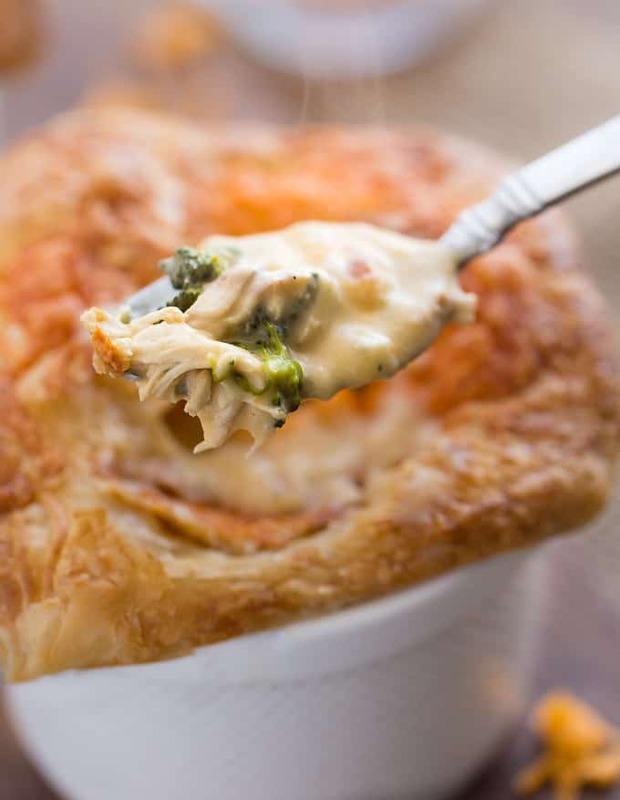 These individual chicken, broccoli, & cheese pot pies look really yummy! Thanks so much for the recipe, we LOVE chicken pot pie and are looking forward to trying it.